The Just Posts is a monthly roundtable of posts that "lift up our planet and all that inhabit it" begun by the inimitable Jen and Mad , and later handed over to Holly and Alejna. The latter two took it upon themselves to re-read all of the 2009 Just Posts, culled it down to a bunch of semi-finalists with the help of volunteer readers, and then put together a list of finalists in twelve different categories. 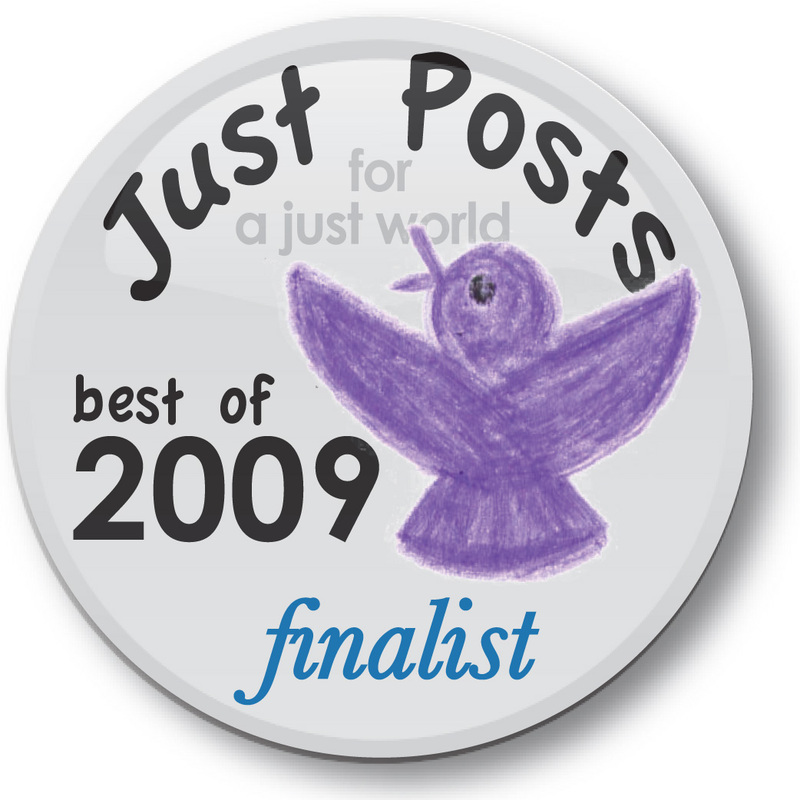 I'm thrilled to have been chosen as a finalist in the "SOCIAL JUSTICE as advocacy/service : Posts related to INFORMATION AND ADVOCACY" category, and of course, I hope you'll go vote for me. But even better would be for you to go over to either Holly's post or Alejna's and read through some or all of the great posts. They are moving, and shocking, and funny, and informative. I voted for you. I'll go back and read the rest of the entries--it will be my Friday night, too tired to walk upstairs yet, activity. Thanks! There goes your readership of Glenn Beck fans!